A country's economy should be viewed from a circular perspective. This doesn't seem natural to most of us because we are used to viewing things from a linear perspective. There's a starting point and an exit point. Take any business. It generates profit for itself and jobs for the community. 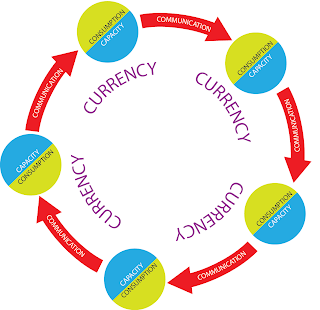 In the process of making as much profit, the business also helps the community and, if you extend the logic ad infinitum, the whole world. This is the line of thought that Adam Smith put up in the Wealth of Nations and has been a strong influence on all free market advocates ever since. Even the communists in China and Vietnam have ditched their old ideology and embraced capitalism. But can this profit-making motivation be extended ad infinitum? Let's analyse this process step by step. Profit entails an increase in assets which can take the form of property, inventory, debt owed by others or money. Now, I usually use the island thought-experiment to see how far this process could go on. Imagine two persons stranded on an island. Each specialises in producing only one type of item. Initially they would exchange their surplus produce to the mutual benefit of both. They could go on forever and if they put a lower price on their cost and a higher price on their sale, they would be making greater and greater profit. However reality is not that benign. There'll always be one person that is more efficient than the other. In the past when technology use was still low, this person would keep on accumulating the factors of production and communication, be they land, slaves, or transport carts or ships. Nowadays, he will acquire modern production and transportation or communication technology. Because modern technology massively magnifies competitive advantage, a small number of successful sellers or producers could corner the market for the whole world. This is no fantasy: Apple with more than $100 billion in cash reserves, and Samsung are extreme examples of winners-take-all in the smartphone market. If you recall the 4C circle, reproduced at left, any skewing of productive capacity will unbalance the circle (for a more detailed reading on the 4C curve, see Reality in 4C). Capacity exceeds production because technology allows the few producers to make do with fewer workers. As more and more of the inefficent green/blue nodes are knocked out of the game, their consumption becomes less and less. The few surviving green/blue nodes keep on producing but how do you keep the circle flowing when there are many busted green/blue nodes? You see there's one more C, that is, the currency leg that can be artificially manipulated to resurrect the dead green/blue nodes as zombies. 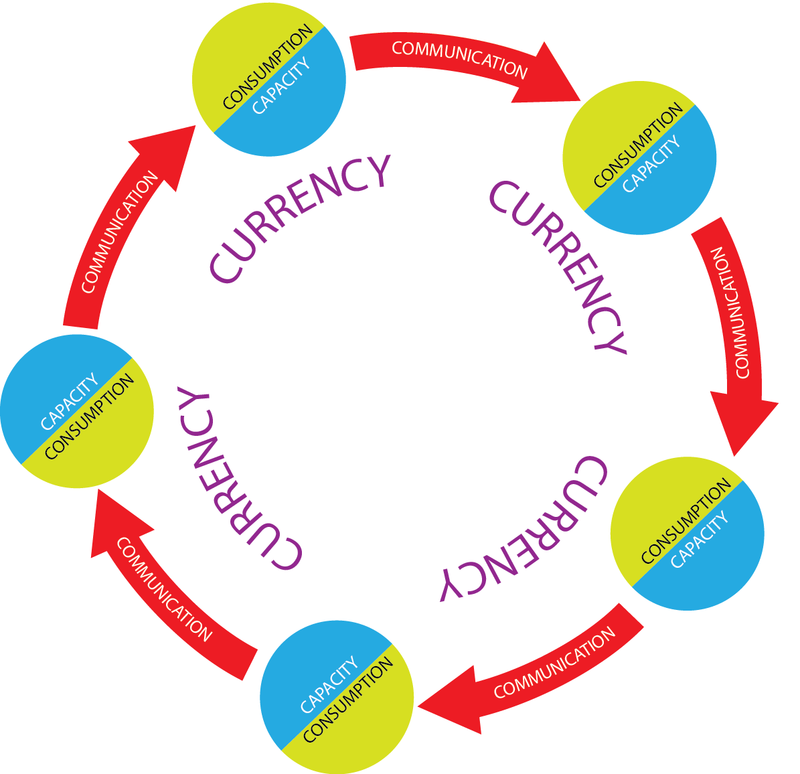 To understand how this is done, we need to view the currency circle. Currency as we all should know by now is 98% debt. So when all else fail, the state can always resort to debt to drive the economy. The debt flow (see graphic at left) is actually the flow of cash in the economy. The blue upper half represents cash inflow while the green lower half, cash outflow. There are actually four economic sectors that are responsible for the inflow and outflow but on this graphic, I've combined business together with finance because business no longer drives cash outflow. Nowadays business debt leverage is prudently managed unlike in the 1930s Great Depression when businesses were responsible for aggravating the debt deflation. On the left side of the graphic are the foreign exchange transactions reflecting inflow from and outflow to foreign countries. This graphic depicts a utopian state in which each economic sector earns approximately what it spends, as reflected in the same thickness of the curved line. Technically, if the flow is balanced, it can go on forever. But as always, reality is never perfect. Where does the central bank fit in the debt circle? Nowhere. Its role is only to lower the price of money so that the households and businesses can pile on more debts. But this is hardly panning out in a situation of excess capacity. The banks are not lending when the borrowers have no income to repay. As for the businesses, with $2 trillion in cash reserves, they have no need for new loans. One reason for the prolonged delay in the liquidation of debt is that the debt bubble keeps being passed from one player to another. We can go back to the Clinton administration (1993-2001) to see the movement of the debt bubble. The following charts (from The New York Times) provide a trail of debt growth among the various economic sectors. To discern the pattern better, I've fitted them in the debt circle graphic below. The thicker line points to the main driver of debt growth. Now, we can clearly see that each administration is not free from fault. Clinton was assisted by the financial sector, Bush by the households, and Obama with all other sectors moribund is left only with the government sector. So naturally he has to spend more than $1 trillion annually to keep the economy on life support. Mitt Romney got it all wrong when he said that 47% of the American public depended on the government. Actually, if you dig back to the root cause, almost everybody in the US and the whole world is feeding at the US government trough. To be sure, under the Bush administration, the financials were also guilty of racking up debts but as I want to bring out the pattern, I've highlighted only the most guilty party. With this, we can predict the next scenario of this debt circle. How would the future pan out? There's no way that the financials and households could make a comeback as the former is shrinking to oblivion and the latter is still stuck with a plethora of debts made worse by a diminishing stream of income. The businesses are more likely to hold on tighter to their money as the economy tanks. When the government sector finally succumbs, as is unfolding in many other countries, all the debt lines will wither presaging a collapse in society, politics and world trade. 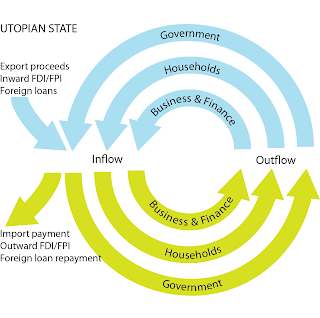 Understanding the economy from a cash flow perspective is much easier than the GDP circular flow. In the next post, we'll view the economy from the perspective of the income statement.